From the July 2004 issue of "Knight Templar Magazine" published by The Grand Encampment of Knights Templar of the United States of America. The year 1923 marked a serendipitous event in the musical community. Clarence Williams copyrighted his song, "Sugar Blues," that year, and a young trumpeter from Ashland, Kentucky, embraced Williams' song as a musical trademark and rode his distinctive trumpet interpretation to fame and fortune. He was Clyde Lee McCoy, one of the country's most enduring and universally acclaimed musical performers. In 1923 McCoy was leading his own little band in New York City, struggling to gain a foothold in the musical world. With national Prohibition in full swing, 5,000 speakeasies in the Big Apple provided a stage to obtain the essential experience. Many of those offered live music for their patrons while they sipped bootleg spirits from a coffee cup. The story of this particular trumpeter began with his birth on December 29, 1904. Clyde McCoy was the son of a Chesapeake & Ohio Railroad detective and a member of Kentucky's Pike County clan locked in a bloody feud with the Hatfield family of West Virginia. The vendetta had dragged on for a half century; however, it soon became crystal clear that young Clyde preferred music to rifles, when he procured a trumpet. At the age of nine years, Clyde began to learn the instrument without the benefit of formal instruction. In 1912 the railroad transferred the elder McCoy to Portsmouth, Ohio, and the family moved right along with him. The nine-year-old soon mastered the trumpet and was sufficiently skilled to perform regularly at church and school affairs. Five years later Clyde was employed as a musician on the Cincinnati riverboats, plying the Mississippi River. He performed on the Island Queen and the Bernard McSwain, both side-wheelers. At 14 years he was the one of the youngest musicians on the river and an outstanding trumpet player, in spite of his youth. Clyde McCoy had all the attributes for a successful public entertainer. He was a personable and extroverted youngster with a natural talent for pleasing musical patrons. His handsome, slender physique, curly hair, and pleasing public persona were all part of a package which included a skilled musical style guaranteed to please the public. He also acquired some formal musical education, primarily to equip himself with the ability to create his own musical arrangements. That skill was devoted to charting a distinctive musical library which was both pleasing to the musical patrons and an exciting departure from the usual dance-music fare. In 1920 while still playing on the river boats, a musical associate informed Clyde of an opening for a band at a popular resort location in Knoxville, Tennessee. It was a two week engagement. McCoy assembled a small band and boarded a train for Knoxville with a group who had never played together as a unit. They rehearsed in the train's smoker, en route to the Whittle Springs Hotel and Spa, providing some welcome entertainment for the passengers. When they arrived in Knoxville, owner George Whittle agreed to audition Clyde's "Chicago Orchestra" and approved of their performance. So did the patrons. The two-week gig lasted for two months, and the Clyde McCoy Orchestra was officially launched as a permanent segment of the musical scene. In the months following the Whittle Hotel engagement, Clyde and the boys slowly worked their way to New York City. They took any job available, and their young leader found enough work to pay the bills. As 1924 ended, Clyde realized that the band was stuck on a plateau in their quest to achieve musical prominence, and he began a working journey to the west coast. The band was playing in the Los Angeles area by mid-1925, as a musical attraction at the Dome Theater at Ocean Park. During that time frame, Clyde and his brother Stanley, the band's bass player, ventured to a local airfield, bent on a sight-seeing flight over the city. They were seated in the side-by-side cockpit of a World War I biplane, piloted by a tall, taciturn young aviator, who had been touted by another airman present as "the best pilot in the world." Two years later, while playing an engagement at the Beverly Hills Country Club, Clyde read a newspaper headline which proclaimed, "Lindbergh Solos to Paris." It was the same young aviator who piloted him on the sight-seeing flight over Los Angeles. Home in Kentucky in 1926, Clyde petitioned Daylight Lodge No. 760 in Louisville. He was promptly accepted and received the E.A. Degree on January 9, 1926; the F.C. Degree on May 8, and the M.M. Degree on June 26, 1926. He became a devoted Mason and a lifetime member of his lodge. Before long, Clyde became a member of the Valley of Memphis, Tennessee, A.A.S.R. , and joined Kosair Temple of the Shrine in Louisville, Kentucky. At his death in 1990, Clyde McCoy had been a faithful member of Daylight Lodge for 64 years, a tremendous record of longevity. 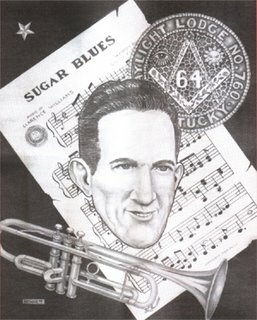 McCoy had been experimenting for nearly ten years with a trumpet mute, which he used when performing "Sugar Blues" and many of the numbers in the bands library of arrangements. Clyde's "wah-wah" style had become a distinctive musical identification, and his orchestra was steadily gaining public stature. However, it was not until the band opened an engagement at the new and opulent Drake Hotel in Chicago in 1930 that Clyde McCoy burst upon the national musical scene. The Kentucky trumpeter's impressive rendition of his "Sugar Blues" solo, backed by a well-rehearsed and musically-disciplined band performance, drew enthusiastic approval from the patrons at the Drake Hotel. The permanent radio wire at the Drake provided national broadcast exposure for the band. Proof of their growing popularity was confirmed when Clyde was signed to a recording contract with Columbia Records. His first studio session was on January 22, 1931. Naturally, the first Columbia disc was "Sugar Blues." It was an instant retail success and continued to enjoy successful sales over the years. At Clyde's retirement in 1985, total international sales of his recording, "Sugar Blues," stood in excess of fourteen million. McCoy's "Wah-Wah Mute" was so popular that he licensed the King Instrument Company to manufacture and market the device. It became a long-term source of income for the astute, young band-leader, one of an impressive list of profitable investments accumulated over the years. The Clyde McCoy Orchestra enjoyed a long and successful run at the Drake Hotel before beginning a year-long engagement at Chicago's Terrace Gardens. Prior to returning to the Drake Hotel to begin a record breaking two-year second engagement, the band was featured in a Balaban and Katz vaudeville production. Chicago became McCoy's professional headquarters during the years 1931 through 1935. In mid-1935 Clyde signed a recording contract with Decca Records, beginning a five-year stay with Jack Katz's very successful label. By 1935 the slim young trumpeter had reached the pinnacle of his career. His success never wavered, until World War II interrupted life in America. Before the band left Chicago in 1935, McCoy was approached by three investors interested in founding a newspaper for musicians. They needed one more investor, and Clyde was selected. The name of the bi-weekly publication was "Downbeat," and it became one of the most popular trade publications in America. One of the "Downbeat" critics, avidly devoted to swing bands, criticized McCoy's music, as "corny, sweet, and gimmicky." It was blatantly unfair to the talented maestro and a tremendous embarrassment to the critic when he learned he had panned one of the owners. Clyde shrugged it off as unimportant. Clyde and the band accelerated their recording activity when they signed with Decca Records. At this juncture, it seems appropriate to review their recording history, as well as point out some of the prominent musicians who toiled under the McCoy banner. As previously noted, the band recorded steadily for Columbia Records from January 1931 through December 1933. The national recording industry was suffering the pangs of the Great Depression in those years, which severely hampered the number of record sales. After signing with Decca, an economy label founded by Jack and David Kapp, McCoy's recording activity accelerated. In addition to conventional retail discs, he began to record regularly at the transcription studios. Those recordings were used primarily in delayed radio broadcasts. Before McCoy entered military service in World War II, he recorded frequently for Associated Transcriptions, both in Chicago and New York. The ASCAP recording ban in 1941 halted recording of all songs composed by its members. However, when the war was over, Clyde resumed recording for LangWorth Transcriptions in New York and several prominent labels, including Mercury, Capitol, and Vocalion Records. Clyde's recorded evergreen standards plus the immensely popular "Sugar Blues" were always surefire successes. The band played a wide variety of Dixieland-flavored arrangements in a driving, swinging style. Clyde's facile trumpet solos always dominated those numbers, stamping his personal musical brilliance on every tune.His diverse musical library dispelled any notion that he was "locked in" to his famous "wah-wah" style. His surviving musical legacy confirms that. The personnel making up the 1935-1936 Clyde McCoy Orchestra represented the most stable lineup of his career. There were few changes over the years, and these mentioned are generally regarded as the creme de la creme. The trumpets were Clyde McCoy, Freddie Train, Duke Dervall, and Tony Donio; the single trombone, George Green; the reed section, George Stone, Tom Ferguson, Chet Lands, and Mick Ashley; the rhythm section, Julie Stauer, piano; Bart Rothyl, guitar; Art Dunham, bass; and Davey Gray, drums. Jimmy Dale came aboard in 1935 to assist Clyde with arrangements. The vocal duties in the band were a minor adjunct before the Bennett sisters joined. After Clyde met the Bennett sisters (their family name was "Means") in their hometown of San Antonio, Texas, they were added as an important part of the musical company. They were Maxine, Marguerite, and Charlie Bell. A younger sister, Billie Jane, arrived in 1940, making the group a foursome. The Bennett sisters trio joined the band during an engagement at the Peabody Hotel in Memphis and immediately began taking an active role. McCoy's discography indicates that the sisters' first recording appearance may have been for Associated Transcriptions, under the pseudonym "Symphonettes" in June 1936. By January 1937 the girls were working under their own name, "The Bennett Sisters." Male vocal chores by that time were assigned to Wayne Gregg. Clyde carried a complete vaudeville act with the band when he made theater appearances. He was a fine showman himself and invariably performed an act with a miniature trumpet, along with the Bennett sisters. However, Clyde's famous trumpet was the star attraction wherever the band appeared. One of his theater innovations was `The Battle of the Bands." When Clyde and Don Bestor both appeared at the Circle Theater in Indianapolis, Indiana, because of a scheduling mix-up, the trumpeting maestro suggested they have a "battle of the bands." The audience would determine the winner by an applause meter. It was a great hit with the enthusiastic audience, and Clyde arranged for the result to be a tie. The gimmick was so well-received that he frequently repeated the performance in future theater appearances, with the likes of Kay Kyser and Earl "Fatha" Hines. The McCoy band appeared in nearly every major venue in the country. Clyde never went on vacation, so the band worked constantly, interspersing hotel engagements with theater tours and one-night appearances between longer engagements. Among the major locations the band visited repeatedly were Elitch's Gardens in Denver, the Steel Pier in Atlantic City, the Aragon Ballroom and Hotel Stevens in Chicago, and nearly every major hotel in cities all across America. The Chicago area, a mecca for dance bands in the pre-war years, remained one of the band's favorite locations. Their popularity never waned. Clyde's formula for success was simple. His own words explained it: "I always played what the people wanted." World War II began with the Pearl Harbor attack on December 7, 1941. A few months later, the Clyde McCoy band was playing at the Peabody Skyway in Memphis, when several U.S. Navy officers were seated at a table. They asked Clyde to join them for a talk during an intermission. The recruiting officers persuaded Clyde and his entire 15piece band to enlist en masse in the U.S. Navy. That began a tour of naval duty that took Clyde and his boys to a long list of military installations and hospitals. It was a perpetual morale-building tour and represented Clyde McCoy's great contribution to the war effort on Navy pay! Their record of war bond sales was impressive. After his discharge in January 1945, Clyde rushed to San Antonio to marry Maxine Means, one of the Bennett sisters. They had been courting since the girls joined his band back in 1936. The long-awaited nuptials took place on January 20, 1945, beginning a long, happy married life which was ended only with Clyde's passing 45 years later. Clyde reorganized his band soon after his marriage and had it ready for the road in a few weeks. It was a 15-piece group playing the old familiar tunes, which carried him to musical fame and fortune before the war interrupted normal activity. It was gratifying to learn his popularity had survived the hiatus. For the next decade McCoy worked constantly, reprising most of the scenes of earlier successes and adding new locations to their agenda, primarily Las Vegas. His wife Maxine recalled that Las Vegas or Lake Tahoe were selected for engagements when they needed a "working vacation." It was both a happy and bittersweet time for them. Although the band was completely booked, the Big Band Era was drawing rapidly to a close. Many of the major hotels and ballrooms were closing, due to their inability to afford the expense of large orchestras. In some cases hotels were discontinuing live entertainment altogether. Life style changes were mandatory for Clyde and Maxine. The McCoys invested heavily in a night club venture in Denver, Colorado, in 1955. Clyde had dis­banded his large orchestra and planned to stay active on the musi­cal scene with a scaled-down ensem­ble, primarily at his own establish­ment. Unfortunately, the enterprise was a financial disaster. The dinner club failure represented a severe financial loss for Clyde, and he immediately resumed touring to recoup his fortunes. Working constantly with his 7­piece ensemble, he met with an enthusiastic reception at every appearance. He traveled coast to coast, playing those driving Dixieland arrangements. His bril­liant trumpet performances enjoyed undiminished acclaim from enthusi­astic audiences. Clyde was on the road again and would never stop. A number of McCoy alumni moved on to other prominent orchestras over the years, before and after WW II. Prominent among those names were pianist Lou Busch (a.k.a. Joe "Fingers" Carr), trombonist Eddie Kusby, and vocalist Rosalind Marquis all signing on with the renowned Hal Kemp organization. Another McCoy alum­nus, pianist Jack Fina, became an important member of the Freddie Martin Orchestra before organizing his own fine band. Clyde and the lovely Maxine finally settled in Memphis, Tennessee, in 1978. A luxurious con­dominium became their musical headquarters between road trips. Clyde fulfilled appearance com­mitments, usually with a small Dixieland combo, until the mid­1980s. The quality of his performance never deteriorated, and he willingly played the numbers which his legion of fans had known for so many years and loved. Who can forget Clyde's rousing solos on num­bers like "Black and Tan Fantasy," "Streamline Strut," "Tear It Down," "Wah Wah Lament," "Twelfth Street Rag," his original theme, "A Lonely Gondolier," and Bix Beiderbecke's old favorite, "Jazz Me Blues"? The Kentucky trumpeter had enough evergreen numbers in his repertoire to play an entire evening of requests, without playing a current hit tune. Clyde was a dynamo of energy. During his days at home in Memphis, he often tutored young and promising trumpet students. His entire life was music, and he never stopped prospecting for talent. He loved to share his own knowledge and exper­tise with a deserving protégé. Unfortunately, the long happy union never produced children for Clyde and Maxine. Possibly, that was one reason the McCoys continued traveling and performing for audiences as long as Clyde's health would permit. He played a concert in Sarasota, Florida, in 1985 at age 81, his final public appearance. The delighted audience refused to allow Clyde to leave the stage after playing his old theme, "Sugar Blues." They demand­ed an encore of the same number, and he was happy to oblige. It was a fitting farewell for the aging trum­peter; ending a professional career which spanned 68 years, from a beginning on the Cincinnati river boats in 1917, a rare achievement for any professional musician. Clyde went into retirement as his health began to fail. The early stages of Alzheimer's disease were diagnosed, and he steadily lost ground. Maxine adamantly rejected medical advice to admit her beloved Clyde to an extended care facility. She turned their home into a virtu­al private hospital and became his only caregiver. Her beloved Clyde died in her arms in their home on June 11 , 1990, at age 86. That was the way they both wanted it to end. Private memorial services were offered on Friday, June 14, 1990, at the Memorial Park Rotunda in Memphis, where Clyde McCoy's mortal remains were entombed in the mausoleum. It was the final curtain call for one of America's musical pio­neers and an artist of great ability. Clyde McCoy's life was a model of good citizenship, exhibited by a Freemason who knew the meaning of "square work, and square work only." He was a credit to his profes­sion and a beacon of inspiration to countless Freemasons who knew him through his music, if not in per­son. Clyde Lee McCoy exemplified a legacy of everything that is great and good in our Craft, and we rejoice in his life as we revere his memory.